PLEASE FULL VIEW MY WALL TO SEE ITS TRUE QUALITY! After 6 days making this wall, im finally done. This is a continuation from my other wall, "Taxi Please". The colors are awesome and the textures on the background fit perfectly! Excellent job! wonderful work! i love the style and the colors! :) what else can i say? Wow, well done! Its so cute! Haha, I really like it. Haha very creative and unique. Candyland... yumm. XD Keep up the beautiful work! Oh yes very adorable. The background looks great. So creative! The colors are are nice. Awesome Job! a fave for token of my admiration of this wallie! 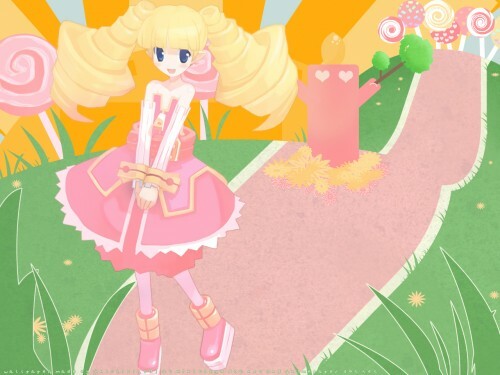 Really cute and white wallpaper , great choice of scan , it's fit perfectly with the BG . I loveeee those lolypop on the top of the road , they make me think of the lolypop city ^^ The orange sky is a great choice. so great lovely wall chi-chan ^__^, such a super cute wall >.<, i do love from the way to work with the scan to turn to that color ^^, nice texture too, only one thing i just wonder why you didnt vector it? that'll be more great if the whole wall is your work ;) right ^__^. waii! Another wall from you with a charcoal boy! XDTeh wall is awsome, great, cute, colorfull, cheerfull, enjoyfull, lovely, & very well done^.^ Teh character is very pretty & cute, also great job changing teh dress color! Teh charcoal man looks so funny! Especially with his heart shaped eyes! & great job ataching the tree to him! Teh chandies made me want to eat them.. nyam..nyam.. lol The road & grass are great! & also great vectoring! But maybe it's to dirty with those splaters. The base bg is very bright! & colorfull! Awsome job! I'll defintaely add this to my favs! Keep up teh awsome work! Its really cute! I like your theme! I like the way U did the charcoal man, Its so cute! such a bright coloured wallie with happy atmosphere ^_^ the idea of charcoal boy following the girl to the candyland is very nice ! and the carcoal boy is so adorable looking when trying to hide himself :3 the background is very pink and bright, really giving the theme of candyland. scan fits nicely with the background and you made good job changing the colours of it. her pink dress looks like it's made of cottoncandy or huge meringue XD overall lovely job and thank you for sharing !